This is the Goodie Bag I received from Grace - a Mary Kay Independent Beauty Consultant. I met her at Mon Sheong Fashion Show when I was volunteering there. Since we both thought it would be a fun idea for me to get to know and try Mary Kay's products, she provided me a Goodie Bag to play with. So I won't exactly call this a Sponsored Post since she's more of a friend and I wanted to spread the word! As you can tell, there are many sample products in the Goodie Bag. It's quite difficult to entirely test it out due to its size (too small in quantity to test more than once) and the packaging it is in (I suspect that some of the products may not be able to preform to the best of its abilities). Part 1 will focus on one item, and Part 2 will be more of a swatch and a mini review of the remaining items. Mary Kay®, a trusted global name in makeup and skin care for over 45 years, is available through Mary Kay Independent Beauty Consultants. From super-effective skin care formulated with ingredients that deliver age-fighting benefits to on-trend makeup to body care that pampers and protects, you get customized beauty routines that fit your needs. And you can get the ultimate in customer service from your very own “Mary Kay Independent Beauty Consultant”. 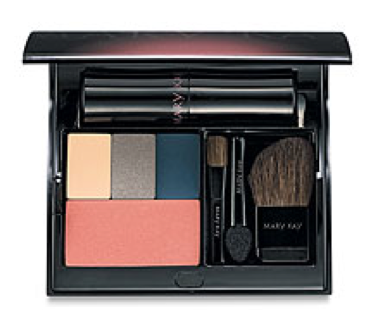 Or become a Mary Kay Beauty Consultant yourself and “earn extra money selling Mary Kay®” products. The sample given is a resemblance of this compact. This compact is quite convenient as you can customize your own eyeshadows, blushes, and comes with a lipstick. Note: Instead of 3 E/S, you can replace with 1 blush instead. The compact retails for $22 here. This is the FOTD I created with the Products Mentioned in this post except for:::: BB Cream, Concealer, Setting Powder and Eyelid Primer. What it Claims: The new mineral-based formula is famous for its oil-absorbing properties, ease of application and excellent coverage. Plus, these long-lasting, crease resistant, fade-resistant shades look fabulous on every skin tone. Review: I found that the colors varied slightly. The matte color (Navy Blue) had poor pigmentation while shimmer color (Blue Metal) was great in pigmentation. Sweet Pink was too close to my skin color to show up, but again partly because it was a matte color so pigmentation was poor. I did use UDPP as my eyelid primer so its "ong-lasting, crease resistant, fade-resistant" properties were offset in this case. I found that blending with matte colors was difficult but with the shimmer was extremely easy. Lastly, I do agree that it does look great on my skin tone though because I can barely pull of blue eyeshadows. What it Claims: Blend in? Follow the pack? No way. Women want to celebrate their individuality every way they can. And Mary Kay® Mineral Cheek Color lets you do just that. It gives you options that look gorgeous no matter what your skin tone. Customize the fade-resistant colour with a light sweep for a natural blush and then build it as you like. Review: It is low in pigmentation which like it claims, allows you to build from natural blush to dramatic. It didn't fade during the entire day. I believe it has lived to expectations. What it Claims: These long-wearing, stay-true colours glide on with a lightweight, creamy formula that provides instant moisture and maximum colour that lasts. Review: I really liked the pigmentation and I liked the color as well. As mentioned before, I do think that the packaging of this sample may have altered the performance of the products. I don't find the lipstick at all moisturizing (my lips appeared chappy) and it wasn't long lasting for me. It does tend to smear off easily as well. I would recommend trying the Mary Kay Mineral Cheek Color as it did live up to its claims and I liked how it looked natural on me. If you are interested in the Eyeshadows, I would recommend trying Shimmer colors instead of Matte. I hope everyone is having a fabulous weekend. For those in Toronto, I hope you are dressed warm as we're having cold temperatures! =( I just want to stay home!! And those in America, happy belated Black Friday, the sales are still going on and I must say they are Awesome!! haha I made my first order to ELF this weekend! woohoo! Last but not least, one of my bigger buys of this week would be my Clarisonic Mia in Pink! The website say they should be arriving sometime this week or next week. Can't wait!! Until Next Time! Thanks for dropping by! !